Got leftover mashed taters? 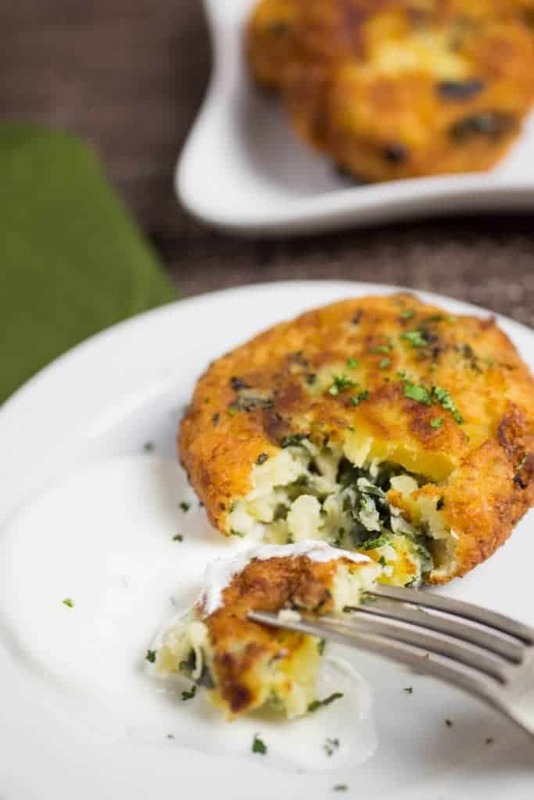 This Easy Leftover Mashed Potato Pancakes recipe are crispy on the outside and fluffy on the inside! Perfect as a vegetarian entree or side dish too. It’s happened to you before. You’re making a big holiday dinner and you didn’t think the 5 pound bag of potatoes would be enough, so you mashed 10 pounds instead. Now there’s 4 extra large Tupperware containers full of this starchy veg and you’re screwed because there’s no more gravy left. If this sounds familiar, then keeping on reading, because you need this recipe for leftover mashed potato pancakes in your life. Trust me when I say, you won’t even miss the gravy on these taters. This is a very versatile recipe, as any kind of leftover mashed potatoes will do. For a side dish, keep it light and use the potatoes as is or add in some fresh herbs or favorite spices. To make as a main meal, add in shredded cheese and/or a cooked protein. Recently I found myself in a leftover potato situation after celebrating St Patrick’s Day. There was a rather large amount of slow cooker colcannon after our dinner and I knew exactly what to do with it. Tater cakes to the rescue! 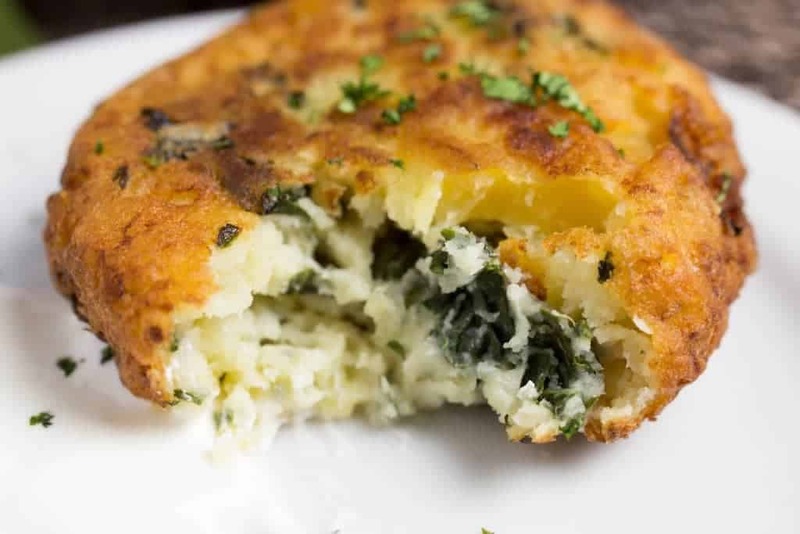 The cabbage and kale vegetables in the colcannon mixture seemed to almost melt into the buttery mashed potatoes and the exterior crunch was absolute perfection. I shallow fried the cakes in avocado oil and the result was an unbelievably crispy on the outside, fluffy on the inside, potato pancake. Served with sour cream and chives, it tasted just like a fried baked potato. I love a good crunchy potato more than anything in the world. Make sure the leftover mashed potatoes are completely chilled. They should be thick and not too loose. The less flour used the better. Flour is used as an important binder in the cakes, but if too much is used, they will taste like flour and not potatoes. I don’t like to use more than 1/2 cup of flour for 3 cups of potatoes. If more flour is needed, feel free to add up to 3/4 cup, but be careful with adding any more. 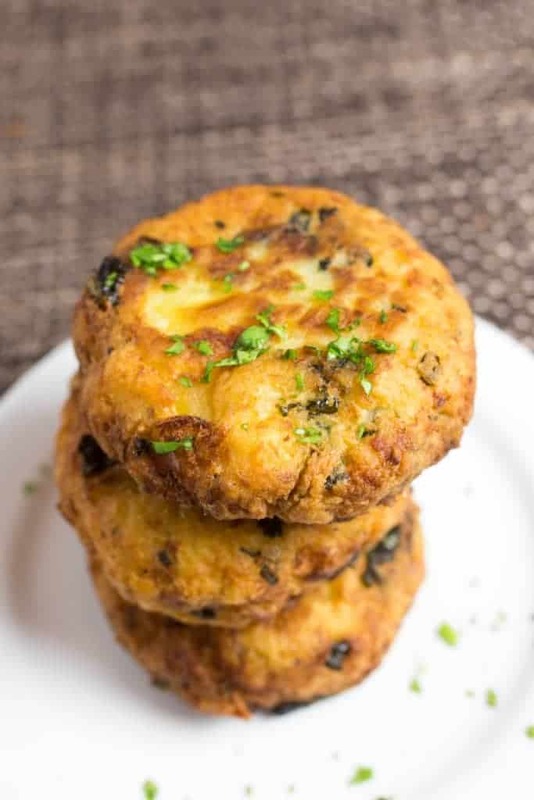 Because they are tater cakes, not flour cakes..
Be creative and add in fresh herbs, favorite spices, shredded cheese, and/or a cooked protein. Use a good quality oil for frying and maintain the temperature at 365F/185C degrees. Serve the pancakes with sour cream, applesauce, salsa, hot sauce, cheese sauce, kimchi. Basically serve them with whatever you want. Tater cakes don’t judge! 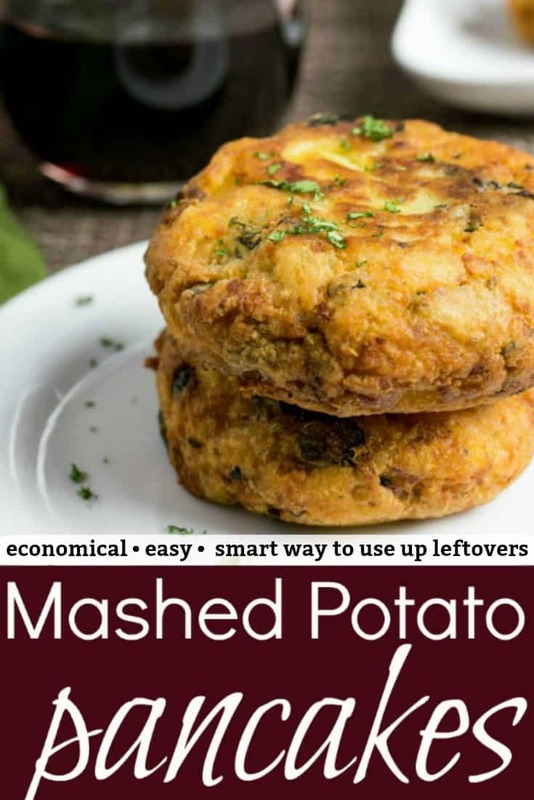 So, when you find yourself with lots of leftover potatoes, make these Mashed Potato Pancakes! If you enjoyed this recipe, please leave me a comment below and I truly appreciate sharing the recipe with friends and family. Got leftover taters? 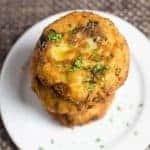 Use this easy leftover mashed potato pancakes recipe to make crispy on the outside and fluffy on the inside pancakes. Perfect side dish! optional additional ingredients to add to potato mixture: any cooked meats or vegetables, cheese, and/or spices. accompaniments for cooked pancakes: chopped green onions, sour cream, or applesauce. Place the mashed potatoes (I used leftover colcannon) in a large bowl. Gently mix in the flour and beaten egg (and any additional ingredients if using). Form mixture into 9 pancakes and place them on a plate. Cover and refrigerate the potato pancakes until ready to use. In a large cast iron skillet or suitable frying pan, heat about 1/2 inch of oil over medium-high heat to 365F/185C degrees. Add 3 pancakes at a time to the hot oil, being careful not to crowd pan. Shallow fry for about 5 minutes on one side, then flip over and cook 5 minutes on the other side, until cakes are brown and crispy. Remove the finished pancakes to a baking sheet lined with a cooling rack or paper towels and keep warm in a 200F/93C degree oven. Repeat process with remaining potato mixture until all the pancakes are made. Sprinkle the pancakes with the chopped green onions and serve with sour cream, applesauce, etc. This is a great idea, but with the greens, it’s a really great idea! These look amazing! and with the greens they are basically healthy right? OMG you perfectly described be with a 10 pound bag of potatoes and an overflow of mashed potato filled Tupperware in my fridge. Next time I’m making these awesome potato pancakes and topping them with anything I want since, thank goodness, taters don’t judge! Pinned! 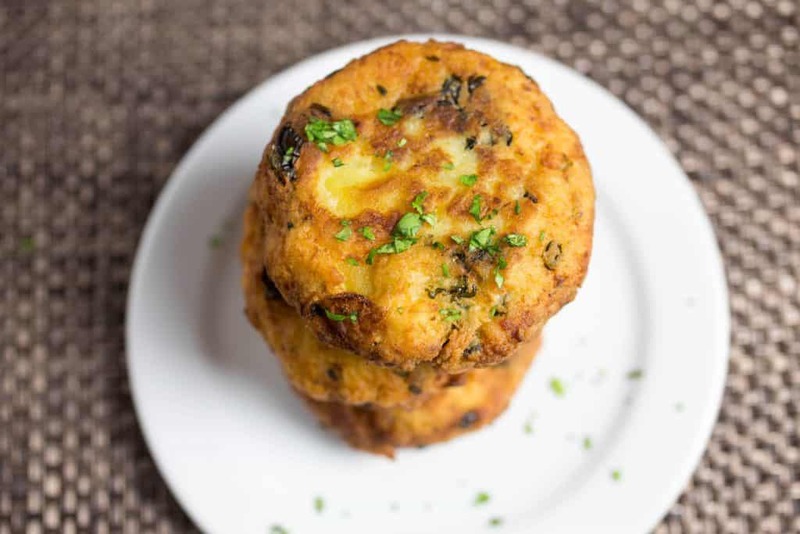 I think I’d make an extra huge batch of mashed potatoes just so I could make these potato cakes! They look so yummy. I’d definitely eat mine with sour cream! How friggin’ fun are these!!! I wonder if my husband would like them. He hinted yesterday about how much he loves mashed potatoes – I think he wants me to MAKE them! haha! OMG! If these taste as good as they look, they will be my new favorite dish!!! 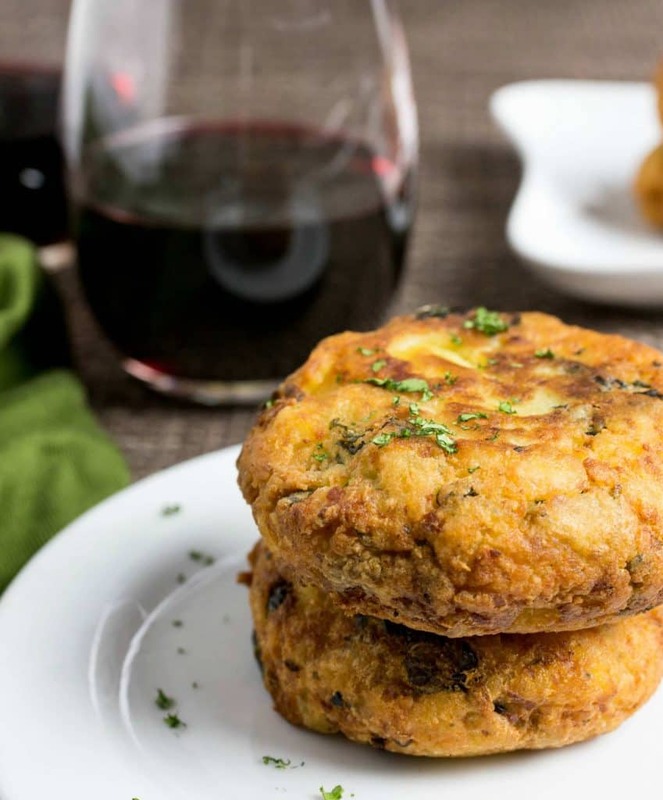 These looks like the best potato cakes ever. I am totally drooling. I ALWAYS have left over mashed potatoes. I love the idea of making potato cakes with them. I’ve had trouble with them falling apart in the past so I’m going to try your method. Thanks! Thank you Barbara and so happy you liked the recipe! Excellent recipe. I used paleo flour, added chopped, smoked bacon. Yum! Thank you for sharing the recipe. Thank you so much for taking the time to comment Ginger and so glad you enjoyed it! And a big high five and heck yeah to adding BACON!!!! lol!